Ron Turner, owner of Last Gasp who was celebrating 40 years of being in business, assumes the usual party position, drink in one hand, beautiful young lady in the other. Now that was a party. Thursday night underground publisher/distributor Last Gasp celebrated it's 40th anniversary with a Warholian extravaganza of historic proportions. The crowd was a who's who of alternative publishing, art, and literature from the past fifty years. The event was one of the most impressive gatherings of artists I've ever seen. It's a good thing there wasn't a terrorist attack because a bomb going off in that room could have wiped out alternative culture as we know it. Things kicked off early with a reading to a mostly packed house by San Francisco Poet Laureate Diane Diprima, Bucky Sinister, Jeri Cain Rossi, Jon Longhi (yes that's me), and Michelle Tee. As the evening went on the bodies packed in like sardines. Soon the crowd was so dense you could hardly breathe and it stayed like that for most of the night. Supervisor Ross Mirkarimi personally delivered a proclamation from the city of San Francisco. Mark Leno's office sent a certificate of recognition from the state senate. Tom Ammiano sent a similar proclamation from the state assembly. Art luminaries such as Stanley Mouse, Spain, and photographers Robert Altman and Christopher Felver were in attendance. The brothers who invented the proto pipe were there. Warren Hinkle held court while former pornstar Missy Manners wandered the crowd. Everywhere you looked there was a famous writer or cartoonist. Last Gasp is the creation of Ron Turner and is run by Ron and his son Colin. He officially launched the company on April 15th 1970, the first Earth Day, with the publication of Slow Death Funnies # 1, an ecology themed underground comic. In the ensuing 40 years, Last Gasp has published or in some cases discovered almost every major underground artist of note. Ron has sold books to every subculture scene along the way be they hippies, punks, ravers, hot rod and tattoo freaks, you name it, if someone was doing something different and alternative he probably had a hand in it or at least sold them a book. The art exhibit at 111 Minna illustrates this crazy patchwork quilt of history with a selection of artworks so varied and intense that one feels almost schizophrenic after viewing the entire thing. On display are canvasses, drawings, and photos by all the major underground artists of our time: Robert Crumb, Mark Ryden, S. Clay Wilson, Camille Rose Garcia, Liz Mcgrath, Tim Biskup, Gary Baseman, the list goes on and on. Robert Williams, who is in the latest Whitney biennial, contributed a new print. Original drawings by R. Crumb share wall space with ones by Rick Griffin and the other Zap cartoonists. Some of my favorite work in the show was by the lesser know artists. A few pieces by some of the early underground cartoonists had a kind of decadent derangement that left me speechless in wonder. Ron and Colin Turner have ridden an arch of history and creativity that is completely unprecedented. Look at the book and comic covers that surround the walls of 111 Minna. Sure there's the familiar names like Crumb and Robert Williams, but there are also tons of lost freakazoid artists the likes of which we will never see again. The history of underground comics has yet to be properly documented so this is a rare chance to see some of it's great lost treasures. 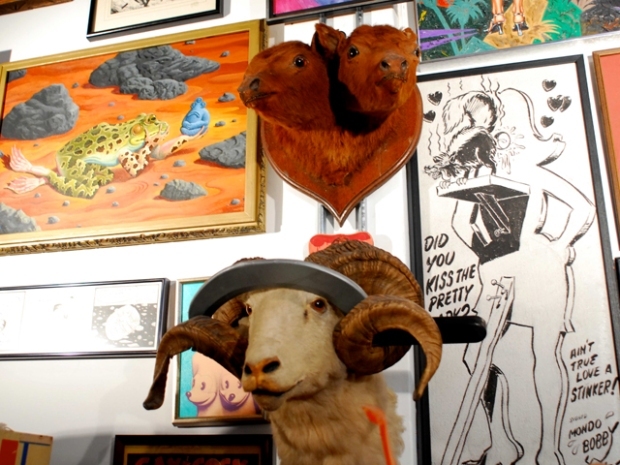 Last Gasp has created an artistic cornucopia that is savage strange and beautiful. The show up at 111 Minna is a rare chance to witness it's amazing history in all it's grandeur.